Kids play with the food they don’t want to eat. George Lerner, an inventor who figured that vegetables and fruits with a little personality might have a better chance, created a set of silly face parts that could be stuck into produce. In the late 1940s, Lerner attempted to sell the product to toy companies, but many expressed concerns that parents who lived through World War II-era food shortages would not consider food a plaything. He finally secured support from a cereal company that planned to use the pieces as toy premiums. Shortly after, the Hassenfeld brothers (later Hasbro, Inc.) paid the cereal company to halt production and the pair acquired the rights to Lerner’s creation. Hasbro packaged together 28 different plastic facial features along with a Styrofoam head for kids to practice making wacky expressions. Soon Mr. Potato Head was the first toy to be advertised on television. The gimmick proved simple—“Meet Mr. Potato Head, the most wonderful friend a boy or girl could have.” Within a few months, Mr. Potato Head earned Hasbro more than $4 million in sales. Mrs. Potato Head joined Mr. Potato Head on Valentine’s Day in 1953. The pair sprout a family (brother Spud and sister Yam), had various pets, and a car and a trailer. Hasbro promoted the happy family in LIFE magazine. A decade later, government regulations and continued criticism related to food wastage prompted Hasbro to introduce a plastic potato head. Mr. Potato Head and Mrs. Potato Head quickly became a celebrity couple in the toy world. In the 1960s, the pair acquired a new set of pals known as Tooty Frooties and Picnic Pals. At the end of the 1960s, Mr. Potato Head explored new landscapes in boxed sets called “On the Farm,” “In the Parade,” and “On the Moon.” In the 1970s, Mr. 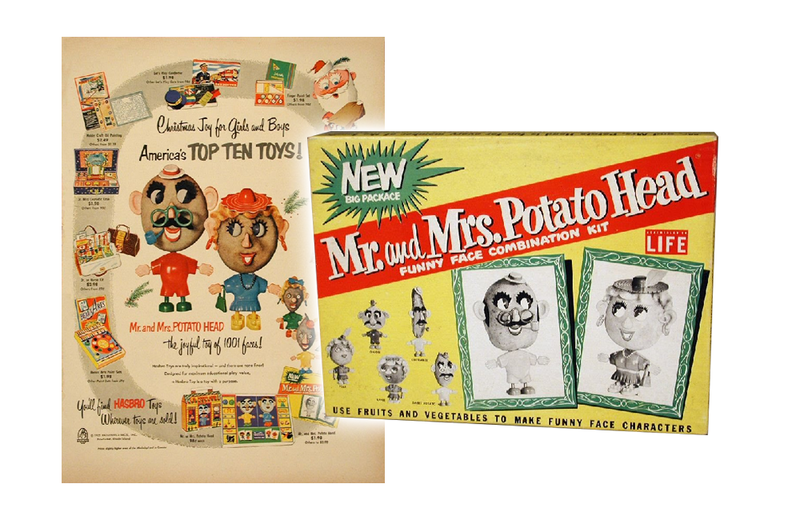 Potato Head teamed up with Donald the Duck and Bozo the Clown in boxed sets. In the 1980s, he abandoned his pipe and assumed the role of spokespud for the American Cancer Society’s Great American Smokeout. He later promoted nutritional values of potatoes in the Macy’s Thanksgiving Day Parade, and in 1992, Arnold Schwarzenegger presented the former couch potato with a Presidential Sports Award. Already a celebrity, Mr. Potato Head and Mrs. Potato Head starred in Toy Story in 1995 and Toy Story 2 in 1998. This exposure gave the big spuds new life on key chains, mugs, ball caps, Christmas ornaments, and boxer shorts. And the enduring popularity of Mr. Potato Head led to his induction into the National Toy Hall of Fame in 2000. Michelle Parnett-Dwyer is Curator at the National Museum of Play at The Strong.